Cole is wearing a home-made R2-D2 costume, a character from Star Wars. 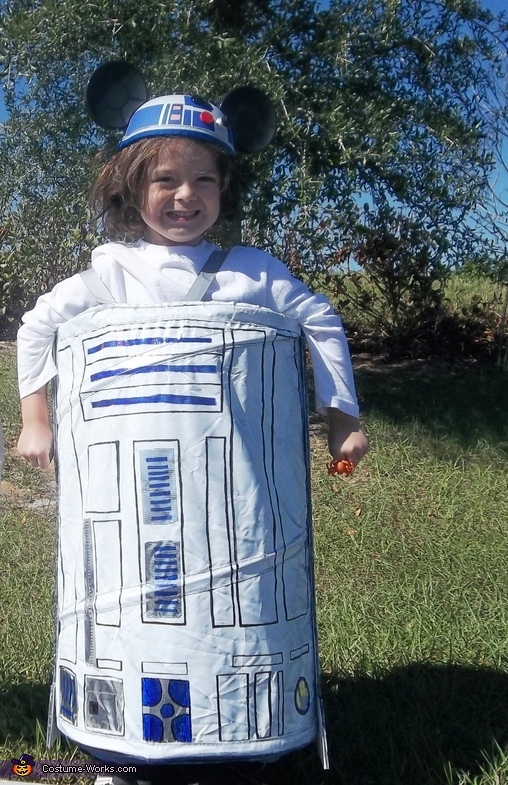 R2-D2 is currently my 5 year old son's favorite character and he refused to be anything else. So seeing as you can't go out and buy a costume for this character, I (mom) made one. I used a collapsible nylon hamper that I spray painted white (2 cans) and then using a toy as my model I used black, blue and metallic silver sharpies as well as a ruler to draw out the designs and little gadgets found on R2-D2 (front & back) as well as metallic silver duct tape. For the legs I used foam board and sketched them out, then colored them in with the sharpies and cut them out with a razor blade, attaching them with hot glue. I used grey 1'' ribbon as the shoulder straps and sewed them on with a simple needle and thread. For the head we lucked out and found a hat at Disney! It was a hit and Cole loved it! Too cute! This costume is an ingenious display of creativity and I love the ears on the cap!